TA Colleen Higgins (Photography) is beginning her Master of Fine Arts Degree at Cranbrook Academy of Art, in Bloomfield Hills Michigan, in the Fall of 2014. Colleen applied to 5 major photography programs and was accepted at all of them! TA John Ahearn (Arts Entrepreneurship) accepted to four graduate schools in ceramics with GA and full tuition. Schools are: Miami of Ohio, Florida State, Edinboro, and East Tennessee State. 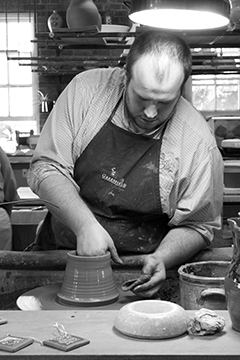 He accepted a full-time position as the Head Potter at Greenfield Village where he continues to work. Courtney Brayman Graduated with a double major ; BA Art, BS Psychology, interned with a Registered Occupational Therapist to continue into graduate school in Occupational Therapy at Western Michigan University. Courtney also interned at Allegiance Hospital and lead and organized the Art Therapy Club’s series of art workshops at the Eisenhower Center for patients who have suffered spinal cord injury. Courtney was the recipient of the Stubnitz Foundation Arts Scholarship in her junior year. She is currently working as an intake specialist at McCollough Vargas, an adjudicated counseling service for adults with substance abuse problems. Sarah Brooks (Digital Design) published a children’s book, “Loud Cloud”in March. She both wrote and illustrated the story. A double major in art and interior design she is now a design associate at Ellwood Interiors north of Detroit where she interned in the summer of 2011. Christina Cramner (Digital-Photo) has been hired as a photo specialist at Photo International in Williamsburg, VA. Exhibitor in many juried exhibitions, she presented her work at the student research conference, Ribbons of Excellence twice. Janene Dusseau (Arts Entrenpreneurship)) is a finalist for an internship at Jeff Daniel’s Purple Rose Theatre in Chelsea, MI and Meadowbrook Hall in Oakland, MI. She is a design assistant at the Croswell Opera House. She double majored in art and Theatre. Janene is interested in technical theatre which matches her interest in installational sculpture and designed numerous sets in her college career. Kristen Fleming (Arts Management) was selected for a prestigious internship in arts management at the Women’s Studio Workshop in NY. The Workshop is the top repository and resource for handmade artist produced books in the country. Kristen is now administrating WSW’s top fund-raising effort. She interned at Habitat Gallery in Detroit, an internationally recognized glass gallery. During her senior year Kristen was juried into a professional exhibition and twice she was awared jurors prizes in the Michigan Small College Exhibition. A frequent volunteer and donor to Empty Bowls, Art-A-Licious, and the Art Bra Auction for breast cancer research, she also minored in English. Samantha Giovenco (Digital-Photo)is a finalist for a job in marketing at Target in their Chicago office. Lexington Health Care, Chicago commissioned a portfolio of over 50 prints to be displayed in their corporate offices. Her work was awarded the top prize at the Student Exhibition and juried into the Michigan Small College Show in multiple years. Carrie Kline (Pre-Art Therapy)was accepted into three top Art Therapy/Counseling graduate programs: Marylhurst College in OR, Drexel University in PA, and Springfield College in MA. She will attend Marylhurst. Carrie also received a scholarship to attend this year’s national American Art Therapy conference. She was VP of the Art Therapy Club Carrie completed three art therapy internships; at the Hope Center for adults with cognitive and physical disabilities, at Lenawee Medical with Alzheimer patients, at the Maurice Spear Center for adjudicated adolescents, and at Allegiance Medical with outpatient adults. Carrie was awared the Elizabeth Milne Ewing Award from Adrian College which recognizes the top graduating female. Kristina Martin (Arts Entrepreneurship)was accepted into the MFA painting program at Kendall College of Art and Design in Grand Rapids and is now attending. During her college career Kristina was awarded numerous awards in juried exhibitions including the Michigan Small College Exhibition. She also completed a large scale seven panel mural for the AmVet organization of southeastern Michigan and lead the Adrian Middle School students in creating their own large scale mural. In her junior year she studied in Florence Italy. Mariah Postlewait (Arts Management) Completed 3 internships in her college career, the first at the Toledo Hot Glass Center, Hudson Gallery in Sylvania, and at the Smithsonian in Washington DC. She also received the top award in the Student Exhibition, the Oxbow Study Award, to study for a week at Oxbow School of Art. Mariah also worked in both the Heritage Room and Vallade Gallery on campus, becoming Head Gallery Assistant in her senior year. She was accepted to three graduate programs in the field of photo and history. Programs include a full tuition and stipend at Bowling Green State University, SUNY Binghamton, University of California-Riverside, and to a top two school in the country in her intended field, University of Arizona. She is attending BGSU for her Masters Degree in preparation for her PhD. Erick Sala (Digital Design) continued his senior research interest in game design. He has been accepted to the Art Academy of San Francisco. Based on his advanced portfolio he was accepted into the 2nd year of a three year program. Sarah Sessions (Art Education) has been accepted to the Urban Institute of Chicago to complete her Associate Teaching in inner city Chicago next fall. She will complete a design internship this summer at Concepts Creative Marketing and Design in Hillsdale, MI. Kristen Smith (Arts Entrenpreneurship) began her illustration business with working for MIS, a mural for Adrian business, Get Growing, and has also developed a Faux Surface painting interior design service. Erika Squanda (Art Education) is completing her Associate Teaching this fall with two supervising AC Art and Design alumni in the Adrian Public Schools. Sydney Wlodkya (Digital, Photography) has been accepted to Bradley University in the MFA program in photography with an 100% tuition award and stipend. During her college career she was photo editor for the College World and the official photographer for the Art-A-Licious Art Festival in downtown Adrian. Sydney also completed two internships, both of which offered her positions at the conclusion. She also was awarded a one-person exhibition through the Student Exhibition in the Heritage Room Gallery and was juried into the Michigan Small College Exhibition twice. Andrea Worthington (Art Education) is associate teaching at Madison School District. She received the Michigan Ceramic Art Association Scholarship in 2011. Only two were awarded statewide. Andrea’s work was purchased for the Permanent collection for the Women’s Center at Herrick Hospital. She became Head Assistant in the Ceramics program in her junior year with responsibility for leading underclass students in maintaining the glaze area in the ceramics studio. Andrea has shown in many juried exhibitions including the Michigan Small College and the Michigan Mud Student Exhibition. She has accepted a position at the Ella Sharp Museum in Jackson as the Children’s art educator.